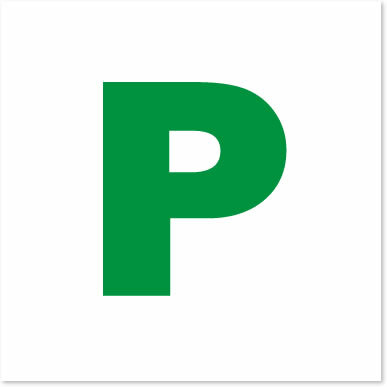 In the UK, green P plates can be used on a voluntary basis by drivers that have just passed the driving test. Unlike L-plates, it is not a legal requirement for the driver to display them on their vehicle. What do P plates stand for? The ‘probationary’ plates or P plates as they are commonly referred to allow other vehicles on the road to acknowledge that a driver has only just passed the practical driving test and although technically they should be up to test standard, they should be provided with extra time and space in the course of driving to allow for any mistakes made. A young newly qualified driver is 30% more likely to have an accident compared to drivers with a year or more experience. In certain countries, P plates are compulsory, however in England, Scotland and Wales, there is no law or legal requirement stating the compulsory use of P-plates. It is entirely the drivers decision whether they wish to use them or not. If a driver does decide to use P plates, there is no law stating the duration in which the plates can be displayed. The driver can use them for as long as they wish and until they feel confident enough to remove them. The only requirements for the use of green P plates in the UK is that a driver must have passed the UK practical driving test. They are not by law required to use them. P plates if used, should be placed one at the front and one at the rear of the vehicle in a conspicuous location. Unlike L plates however, there are no current enforceable penalties for using the incorrect size, incorrectly placed or defaced plates. Displaying P plates, a good idea? P plates like L plates are used to inform vehicles that a driver has limited experience on the road and may be prone to making mistakes. Drivers reaction to P plates however is often quite different to those displaying L plates. Although a driver displaying L plates will have slightly less experience than that of P plates, other vehicles know that there is likely an experienced driving instructor sitting next to them with dual controls that has ultimate control on any given situation. As a result, L plate learners often receive a pretty hard time off other vehicles impatiently trying to get past or hurry them along. Sometimes to such an extent, that many driving instructors often think it would in fact be safer not to display L plates at all. P plate holders often receive a much more lenient attitude towards them however. As with L plate holders, they have very limited experience, but are significantly more vulnerable as they are solely in charge of the vehicle. Other drivers know this and are therefore less likely to bully them due to the possibility of pushing them into making a mistake and potentially causing an accident. So yes, displaying P plates is a good idea and should be displayed for as long as is necessary to become a confident driver. P plate drivers are significantly more vulnerable than learner drivers as they have very little experience and are completely left to their own devices. Pushing a P plate driver to hurry is likely to stress them and increase the potential of an accident. Upon acknowledging a P plate driver, provide them with a greater following distance and more time to react at junctions and roundabouts. What a silly thing to say. Just because you have passed your test, it doesn’t mean you are suddenly a perfect driver. Learning to drive is like learning a language, just because you’ve passed your GCSE French and can order a coffee and ask for directions to the nearest métro, it doesn’t mean you can debate the benefits and drawbacks of Frexit in the language of Voltaire. It was a long time ago but I kept my P plates on for about two weeks before throwing them away. Reason? Other drivers don’t trust you and will take the P (pun intentded 😉 ) and overtake/undertake you because you are perceived as being slow and inexperienced. The only thing they were useful for, was some drivers would tolerate you being a bit crappy at parking. I think unfortunately your experience is becoming more commonplace with drivers less patient these days. P plates are for those of u who are considerate and remember how it is to be a learner. There will still be lots of ignorant selfish people who will ignore or bully their way around the roads. The sticker I will be producing for my kids (one has just passed) will be a “BLACK BOX FITTED – PLEASE BE PATIENT”. The BB is the all seeing all knowing tell tale machine. If she passes a school at more than 20mph she is penalised for it and will end up paying more insurance next year. Just remember we were all learners and all terrible. We all know the macho ‘know it all’ attitude is insecutity and it is nothing to be ashamed about. Why not find a P plater and let them out of a juntion with a smile. Liberating and kind. Sorry all for the length of this email but a button was pushed. I’m not sure whether or not to display the P plates. I’m older & a nervous driver can’t decide??? Personally, I would put the P plates on your car and see how it goes. Using them may give you a little more confidence being as you’re telling other drivers that you’re an inexperienced driver. You should generally find that most drivers will give you a little more time and space. There are a few fools on the roads though and they might try and intentionally stress you, but it’s always best just to totally ignore them (they get bored and give up when they see their actions are having no effect). Unlike L plates, there’s no regulation for P plates, so yes, you can use them as you wish, even if you are not recently qualified. P plates are of course intended to be used by newly qualified drivers, but as there’s no law stating that you cannot use them at any time, then it’s really up to you. You may notice that some drivers will give you a little more room and be a little more patient whist displaying P plates. Give them a try and see if they help.